Caltrain officials said several of its trains were delayed as a result of the crash. The driver of a pickup truck that was speeding and lost control Friday afternoon while exiting U.S. Highway 101 near Grand Avenue in South San Francisco was killed when he plowed through a fence then slammed into a eucalyptus tree, police said. The truck burst into flames when it hit the tree, authorities said, then rolled into a Union Pacific train at about 4 p.m.
Union Pacific spokesperson Francisco Castillo said the vehicle, a Dodge Ram pickup, was traveling at nearly 100 mph in the minutes before the crash. The vehicle's driver was pronounced dead and the San Mateo County coroner's office was called to the scene, Castillo said. Officials with Caltrain, which shares the tracks with Union Pacific, said trains were traveling at reduced speeds through the area and reported delays of around 20 minutes. Trains were cleared to return to travel at maximum speed again just before 6 p.m., Caltrain officials said. 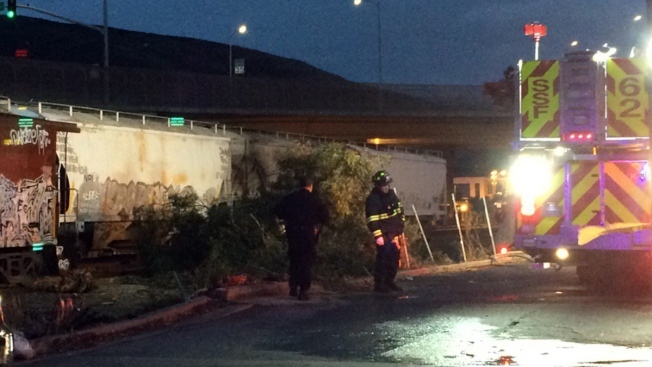 The truck didn't cause any damage to the train cars, Castillo said. The incident did not directly block the tracks or affect traffic on nearby roads, though the fire did damage one vehicle nearby, he said.